Gore met with the president at Trump Tower in New York on Dec. 5 to talk about climate change solutions. In an interview with THR, Gore said that Trump was “receptive” to some of what he had to say. Gore revealed that he has maintained private communications with Trump since the public meeting in December, joking that he couldn’t go into details about how they communicated because the Russians could hack it. “An Inconvenient Truth” was a great success, winning two Academy Awards, including Best Documentary Feature. The film grossed $49.8 million in worldwide box office proceeds, becoming the tenth highest grossing documentary film to date in the United States. The challenges of global warming have only increased in the past decade, with 2016 setting a heat record for the third straight year. Fortunately, renewables are rapidly ramping up as countries aim to meet greenhouse gas emissions reduction targets set forth in the Paris climate agreement. “An Inconvenient Sequel: Truth to Power” opens in Germany on June 15 before hitting US theaters on July 28. 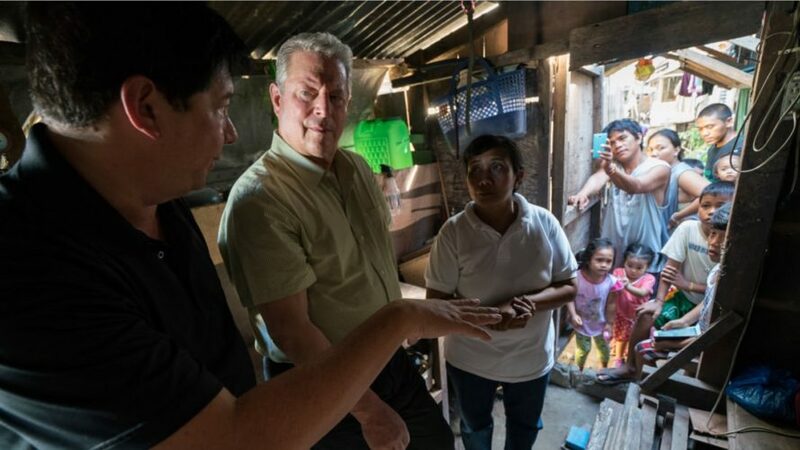 Al Gore debuted his follow up film, "An Inconvenient Sequel: Truth to Power," at Sundance -- a day before an administration in Washington averse to climate change action was about to take power with the inauguration of Donald Trump as the nation's 45th president. Scene from "An Inconvenient Sequel: Truth to Power"